A common theme I’ve noticed since doing these reviews is how short the battery life seems to be on the majority of cat repellents. The solar pest repeller from Petz Trendz claims to solve this problem by using rechargeable batteries that are kept topped up by a small solar panel on the top. 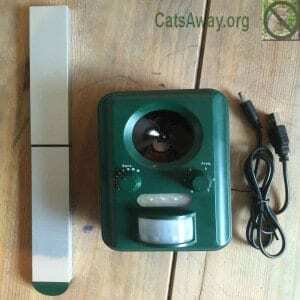 This isn’t the only solar powered cat repeller on the market but with a price tag currently set at just under £13 (£7 off at the time of writing) I had to order it to give it the once over, especially as the only other solar powered deterrent I have reviewed (Solarpest X Animal Chaser) cost me more than double the price of this one. Here’s a video I recorded of my first impressions when opening up the box and testing the various setup options. The first thing to do is to fully charge up the batteries using the provided USB charging lead. According to the manufacturer this will take around 6 hours but once done you should be able to leave it in the garden indefinitely. The Solar Pest Repeller can be fence or wall mounted and also comes with a small stake for ground fixing which is aluminium so won’t rust. It has 2 buttons that require adjusting to your needs: a sensitivity control allowing you to turn the range down from its maximum of 9 metres to a setting best suited to your garden size and a frequency control that you adjust to the hearing range of the animals you are trying to deter from your garden. Position 1 repels small rodents. Position 2 repels foxes and larger dogs. Position 3 repels small dogs, cats and birds. Position 4 gives off a strong flashing from a couple of small strobe lights. Position 5 constantly rotates through all the other frequencies to give all functions combined. Most of the ultrasonic sound cat deterrents I have purchased claim to not effect birds so I was surprised to see level 3 is for cats, small dogs AND birds. This would appear to mean that it operates at a different frequency as a cat deterrent than any of its competitors. As usual for a review I turned off my trusted Contech Scarecrow and Catwatch Ultrasonic Deterrent and there was no cat poop left for me during the few nights I’ve had it set up although this is more likely down to the fact that the majority of the cats in my neighbourhood have learned its best to avoid our garden or risk getting a soak from the Scarecrow. At just under £13 and running costs of zero once you have done the original charge up it represents great value for money and while I haven’t had it long enough to be sure it works, at the time of writing it has 239 reviews on Amazon with an average rating of 4.1 out of 5 so it appears to work for the majority of buyers. The only poor ratings and negative comments I could find claimed it had let water in and failed. I have noticed their does appear to be a slight gap where the the solar panel is attached to the top of the device so this may be a problem with some of the units, depending on how it is sealed inside. I may be tempted to apply some clear external silicone just as a precaution. 239 customer reviews with over half giving it full marks of 5 out of 5. It has an average score of 4.1 out of 5. My Mother has had the solar repeller in her front garden for about 18 months to deter cats from using the garden as their toilet. It has been reasonably effective until recently, I have tried to recharge the battery with no luck. Even after an overnight charge the battery is not fully charged. It could be the battery that’s the problem but it could be a neighbourhood cat has become used to the noise or is too old to hear it. It’s always a good idea to move the sonic cat deterrents now and again to keep the cats on their toes. I bought one of these a couple of weeks ago as all the neighbours who have at least 2 cats was using my front lawn to poo . Not had any cat poo since BUT only problem i have had because my fronts aint massive everytime someone walks up drive it bleeps pretty loud. If the batteries wear out can I use any re-chargable batteries?